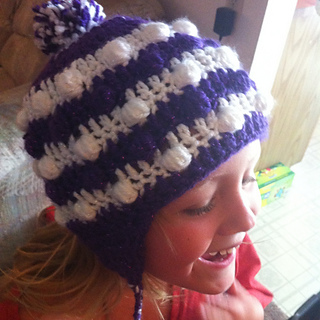 With optional earflaps, pompom, and striping, you can make a wide variety of custom hats with this fun and easy pattern! 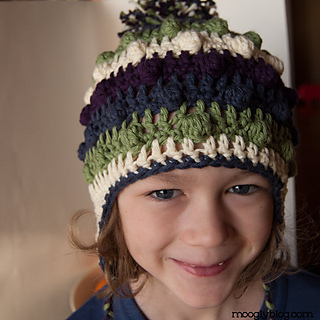 This pattern utilizes the bobble stitch, aka dc5tog, in a unique way. As shown in the linked video tutorial, usually the bobble is made from the wrong side of the fabric, and worked so that it pops out on the right side. 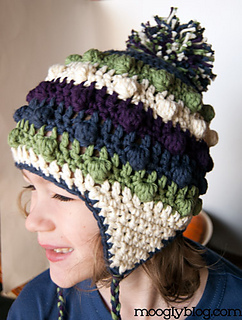 This pattern is made in rounds, and the bobble is made from the right side of the fabric, so be sure to push the bobble towards you as you work the following single crochet stitch. Directions are written for Child’s Size (fits 19-21″) with changes for Adult’s Size (fits 22-24″) in parenthesis. Updated 12/8/12 with Newborn sizing (fits 14”)!